The Southeastern Pennsylvania Transportation Authority (SEPTA) was honored by the American Public Transportation Association (APTA) with the 2012 "Outstanding Public Transportation System Achievement Award" for efforts to enhance service, efficiencies and overall effectiveness. APTA, which has more than 1,500 member organizations, awards the honor annually to agencies that demonstrate leadership and help advance public transportation. SEPTA was singled out for recognition by APTA in a category that includes dozens of North America's major transit operators. "It is my honor to announce that SEPTA has won the 2012 Outstanding Public Transportation System Achievement Award in the category of more than 20 million trips annually," said APTA President and CEO Michael Melaniphy. "This means that SEPTA is being recognized as the best large public transportation system in North America. SEPTA's many accomplishments and achievements are models for the rest of the public transit industry." SEPTA GM Joseph M. Casey said the award is a testament to the hard work of the Authority's employees. "We are thrilled to receive this award, and honored that our peers in the transit agency have singled out SEPTA's achievements for recognition," Casey said. "I am so proud of the members of the SEPTA team, who are committed to serving our customers, and fulfilling our mission to improve the environment, facilitate economic growth, and sustain the quality of life in our region. This recognition is a testament to their dedication, enthusiasm, and innovative spirit." These efforts are also being recognized by SEPTA customers, who continue to use the system in increasing numbers. In Fiscal Year 2012, which covered the period from July 1-June 30, riders took 339.3 million trips on SEPTA buses, trains and trolleys - the highest total since 1989. Fiscal Year 2012 built on the steady ridership growth SEPTA has seen over recent years. Annual trips system-wide are up 32 million since 2007 - indicating success with initiatives to attract and retain new customers. SEPTA has focused these efforts on improving its aging infrastructure to better serve the region, and building a partnership between employees and riders through an effort to enhance customer service. 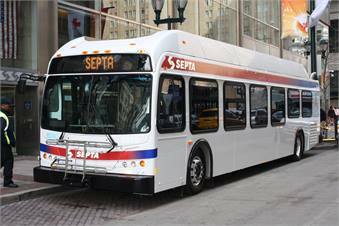 Ridership increases were recorded across the region and on most of SEPTA's modes of travel during Fiscal Year 2012. There were nearly 35.4 million trips on Regional Rail, which is just shy of the 2008 ridership record. Suburban Transit Division bus, light- and high-speed rail modes jumped 4.9%. SEPTA also continues to meet its annual budget mandate, despite continued economic challenges and funding cuts. Fiscal Year 2012 marked the thirteenth consecutive year in which SEPTA had a balanced budget. The agency ended the year with a $491,000 surplus. In addition to taking aggressive action to control costs and increase efficiencies, SEPTA has worked to generate new revenue by expanding its advertising program.